As the performance of applications and processing technology advances, the industry continues to strive for the most photo-realistic designs possible. Designers who work on these projects usually alternate between creating their designs with one application, followed by a full render/ray trace cycle with another application, which can be time consuming and inefficient. With the Radeon Pro Duo graphics card, designers can now simultaneously use two software packages, with one GPU dedicated to the functions of each application concurrently. Live content creation using the first GPU, with real-time rendering and/or ray tracing on the second GPU is now possible. The user can benefit from shortened design cycles or is now able to do more design iterations within the allotted design window for an overall better outcome. "In developing 4K 360 VR content, the biggest hurdle is the tech, because as an artist, I just want to create and not worry about limitations of the hardware. With the new Radeon Pro Duo, I immediately saw a speed difference of up to 2X, allowing me to push the boundaries of my projects without having to compromise on creativity or productivity. 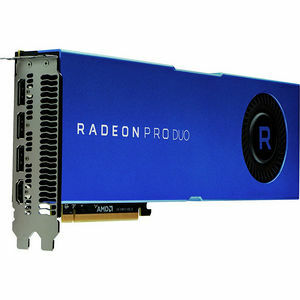 The Radeon Pro Duo, the world's first dual-GPU professional graphics solution, can accelerate supported applications or plug-ins for many of today's popular professional software such as Autodesk® Maya®, DaVinci® Resolve®, The Foundry® Mari® and Dassault Systèmes® SOLIDWORKS®. With 32GB of GDDR5 memory, and two GPUs working in parallel, the Radeon™ Pro Duo delivers up to 113% faster performance than the Radeon™ Pro WX 7100 in Autodesk® Maya® with the Radeon ProRender plugin, reducing the amount of time needed to achieve a users' final design.